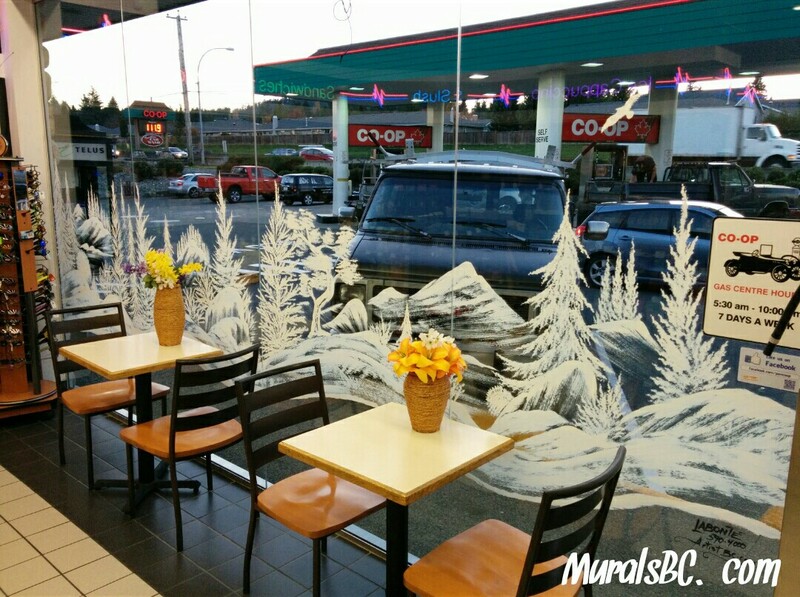 All window murals by Murals BC are original, very affordable and one of a kind paintings, entirely hand painted in such a way to create a very high visual impact, as well as beautifying your home or place of business over the holiday season in Victoria BC. Besides the Christmas window paintings being original hand painted works of art, they highly compliment any place of business or home and certainly capture the spirit of Christmas. Having a Christmas window mural painted on your home Windows is surely going to make you the envy of your neighborhood! Let’s face some facts, we are all busy busy bee’s and often simply cannot find the time to decorate our homes for Christmas. Having Mario come to paint your windows is an easy solution to have you quickly look very festive. Add a few lights here and there and…voila! If I may be so bold as to ask you myself, “would you see this dining room as being the perfect setting to impress any of the homeowners guests over the holidays?” I’m certain we would both agree on the answer! This Christmas winter wonderland window mural, is a small area which has been painted at the Victoria International Airport (YYJ). A beautiful way to welcome travellers in our amazing city over the festive season. The Victoria Grand Pacific Hotel also looks very amazing with it’s “Grand entrance” windows all decorated for the holidays! It certainly is a touch of class and very welcoming for all guests. I love this Christmas Window painting at the Peninsula CO-OP, it creates a nice ambiance for customers to stay and sit for a while before continuing on with their busy day. The painting also allows for essential visibility requirements for the staff. This is a detail view of one of several windows painted at the Best Western Hotel located in downtown Victoria. The center area has purposely been left open for visibility factors. Again we view the Best Western…Looks pretty festive wouldn’t you say? 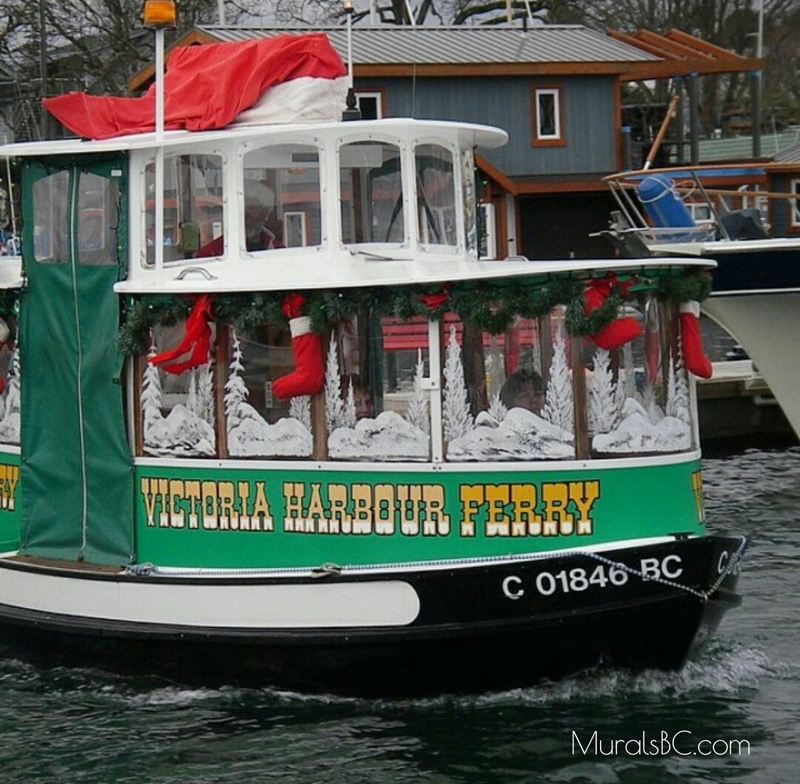 The Christmas window paintings at the Victoria Regent Waterfront Hotel & Suites, is another perfect example of the importance of not obstructing the view. Wow the view doesn’t get any better than this! Another quite stunning window painting at the TD Bank in downtown Victoria. This mural has a very high visual impact, turns heads and gets noticed. Can a similar Christmas window painting help bring attention to your business? I sure would think so! Some of my Christmas window murals painted in Victoria, have a fun and playful twist…as you can see here at the Sizzling Tandoor in Uptown Plaza. I love how animated these twirly window paintings turn out to be. Keep in mind I only paint these on selected windows from which I feel they will be most suitable for. This painting at Fairway Market really compliments the store very much. How about having MuralsBC paint your vacant storefront or office windows?Having the windows painted will surely help increase the rental probability by attracting attention to the space. The painting above certainly helped in getting this once vacant Esquimalt building to get noticed and finally rented. 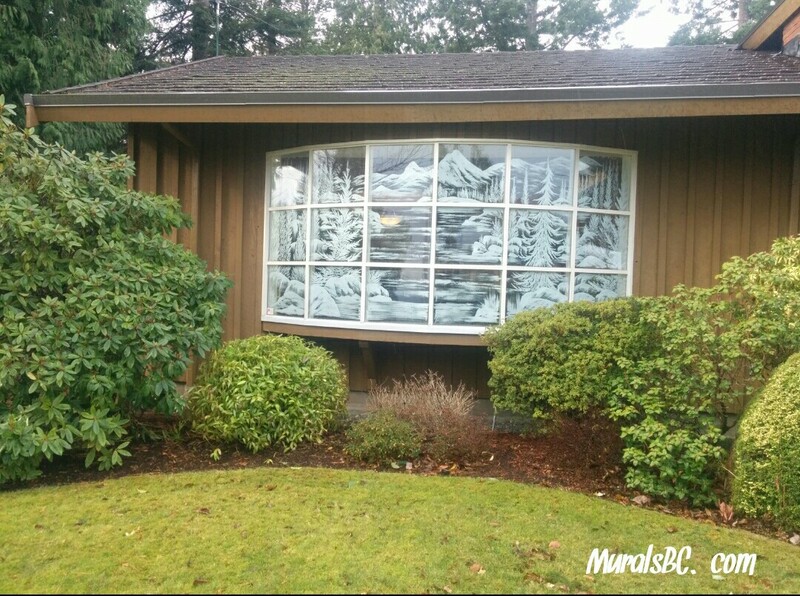 I am a simple phone call or email away from you having me work my magic on your windows. I would love to hear from you and will be very happy to answer any questions that you might have. I encourage you to view my FAQ’s page which might help answer questions you might have about my Christmas window paintings. Stay healthy, happy and always be awesome!